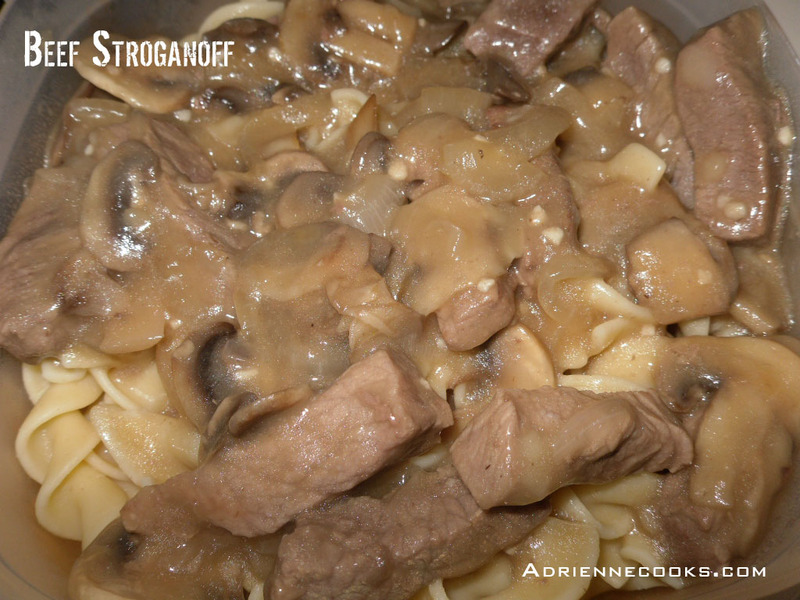 Beef Stroganoff Super Easy Weeknight Dinner Victory! When you’re tired and hungry and determinedly walking the aisles of the mega mart everything starts to look good, even those boxes for ground beef meals with the hand mascot. I know, they are good and easy and cheap. There is nothing wrong with any of those qualities. Below I offer an alternative to the prepackaged meals – one that I think tastes much better and takes just a few minutes longer; I promise. I have a serious addiction to sour cream. I love the stuff. I think that’s why I’m in love with stroganoff (that, and it’s totally fun to say), I douse it with heaping helpings of full fat, creamy, cool sour cream. Yum! 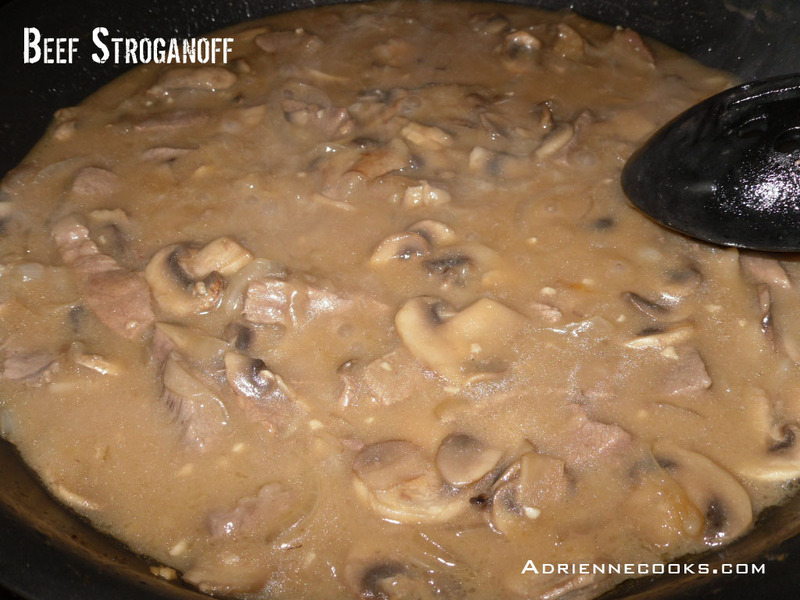 Now I wish there was still some stroganoff in the fridge for me to doctor up. Alas, I’m out of leftovers. I’m sure fancy-pants food nerds out there can tell you exactly where the dish originated and would probably argue that sour cream is not appropriate and blah, blah, blah “don’t have the palate for refined cuisine…” blah. Meh. *Shrug* It tastes good so Imagonnadoit. One point I will not negotiate is that you use meat in its slab/cube form and not ground beef. Ground beef is a food powerhouse, no doubt, but this dish is best executed with sliced beef. Speaking of beef: go pick up a one and a half pound sirloin steak and slice it yourself. Why? Well, for one thing you can clearly identify what you’re cutting up! That is, it’s not trimmings off of 10 different sirloins so you get a good mix of fat and lean, etc. Also, I think this dish is best with strips of beef, around one and a half inches long and just a half inch wide. Stew meat is usually in cubes. So there, I’ve said my piece. Do as you will! So first we need to slice our beef. Cut sirloin opposite the grain into about 1 1/2×1/2-inch strips. Opposite? Yeah, look at the top of your steak. Most of the fibers will be running one direction. Butcher your meat in the opposite direction to make the fibers in your finished dish as “short” as possible, in our case, half an inch. This ensures a nice tender piece of meat – well, helps ensure anyway. Melt butter in a large skillet over medium heat. Sauté mushrooms, onions and garlic in butter until the onions are translucent and the mushrooms have released their liquid. Place the veg in a bowl until ready to combine dish. 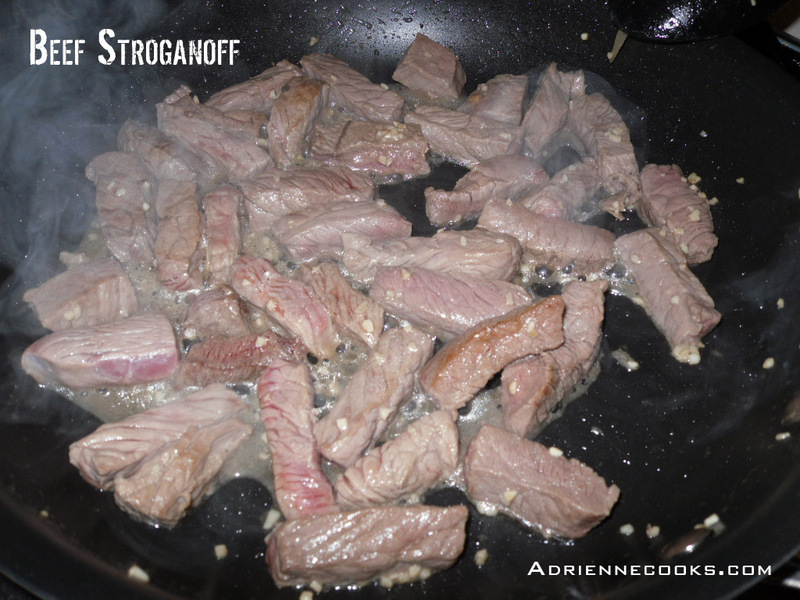 Sauté your beef in the same skillet, don’t wipe it out! Once beef is nearly uniformly brown add one cup of your broth and the seasonings. Bring to a boil, reduce heat and cover and simmer for 15 minutes. Make a roux with your remaining half a cup of broth and flour, that is, mix them together and work out any lumps. Pour roux and vegies into the skillet. Bring to a boil while stirring constantly. Let boil for one minute and then reduce the heat to medium or below. Add your sour cream and serve when the dish is all the same temperature, when the sour cream warms up – DO NOT BOIL WITH SOUR CREAM – trust me. Now just serve over your hot n’ ready egg noodles. Enjoy. If you’re like me, you’ll enjoy it with even more sour cream! Yum! Needed a good stroganoff recipe since I “lost” mine about a year ago. Thanks for stopping by my blog! 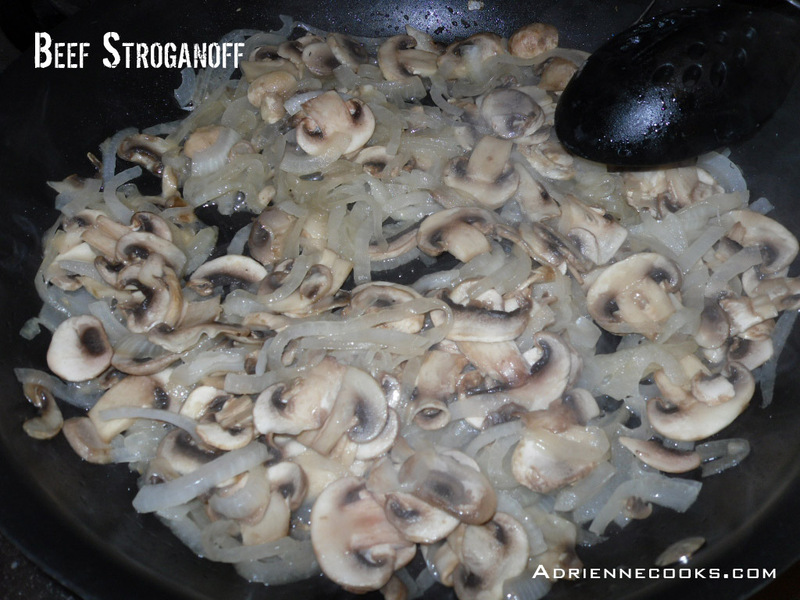 I love stroganoff! Looks good!!! 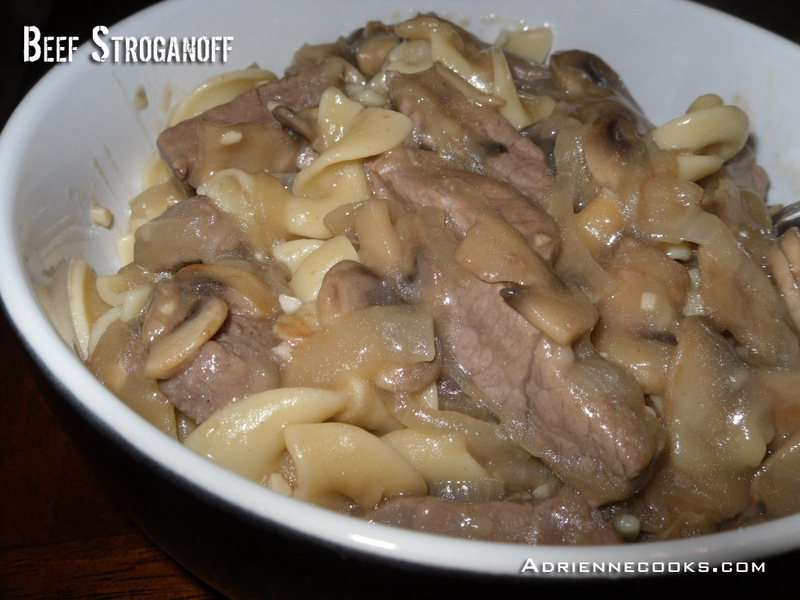 You’re absolutely right, stroganoff is so much better with strips of meat. 🙂 May I also suggest adding some red wine to the sauce before simmering? It makes it so wonderfully rich. Great recipe!